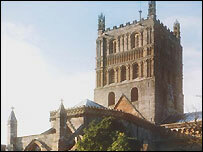 A former church organist has left his £300,000 home and musical instruments to the historic abbey where he played. Tewkesbury Abbey has received the huge bequest from Michael Peterson, a bachelor who died on 5 April, leaving an estate of £1.6m. The 83-year-old left his Tewkesbury farmhouse, garden and a surrounding apple orchard, worth £305,000 in total, to the abbey. He also left £400,000 to the Abbey School Choral Scholarship Fund. According to Mr Peterson's will, the proceeds from the sale of his property must go towards the maintenance and upkeep of the musical needs of the abbey, including its organs, organists or choir. Abbey officials now have to decide what to do with the property. Spokesman Richard Ascough said the donation was a huge boost for the 900-year-old church. "We're exceedingly grateful for this," he said. "It will be of huge benefit to the abbey in terms of maintaining the choral standards set by Michael and his successors."